Draft statement of provisional government designated as cultural heritage. November. 07, 2018 07:26. by Won-Mo Yu onemore@donga.com. 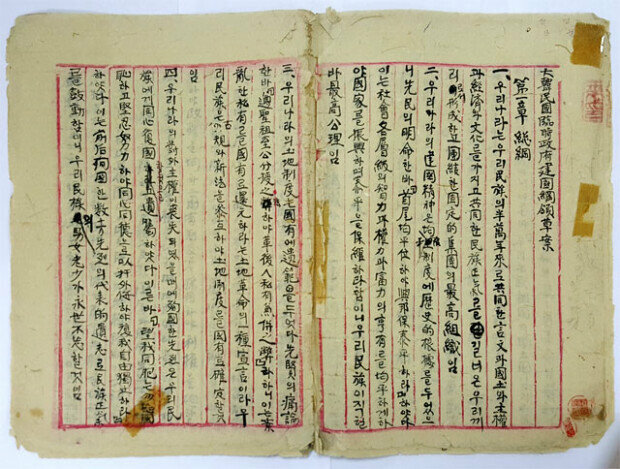 “The draft statement for the establishment of a nation by the Provisional Government of the Republic of Korea,” which is considered the foundation of the country’s first 1948 Constitution, has been designated as a cultural heritage. 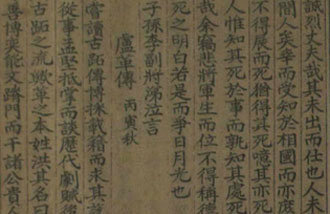 "The draft statement for the establishment of a nation by the Provisional Government of the Republic of Korea” handwritten by independence activist Cho So-ang (whose real name is Cho Yong-eun) in Korean and Chinese based on his principle of three equalities will be registered as a cultural heritage,” said the Cultural Heritage Administration Tuesday. The principle of three equalities, advocated by the theorist and political ideologue of the provisional government, refers to the equality of political, economic, and educational rights to realize an ideal society. The draft drawn by Cho is 10 squared manuscript papers long, which are 39.6 centimeters wide and 27.1 centimeters long, and consists of three chapters including the overview, restoration, and establishment of a nation. The statement was partly modified and passed at a meeting of the provisional government on Nov. 28, 1941. “The document is of great value as it shows which kind of a nation the provisional government wanted to build and contains direct marks Cho So-ang made while revising the draft,” the Cultural Heritage Administration said.